Since our last update, the Eagles have finished their draft and signed a bunch of free agents to complete their roster. They also made some key staffing changes, which helps us understand some of those roster additions. I’m talking about the revamp of the Eagles’ pioneering Sports Science department. 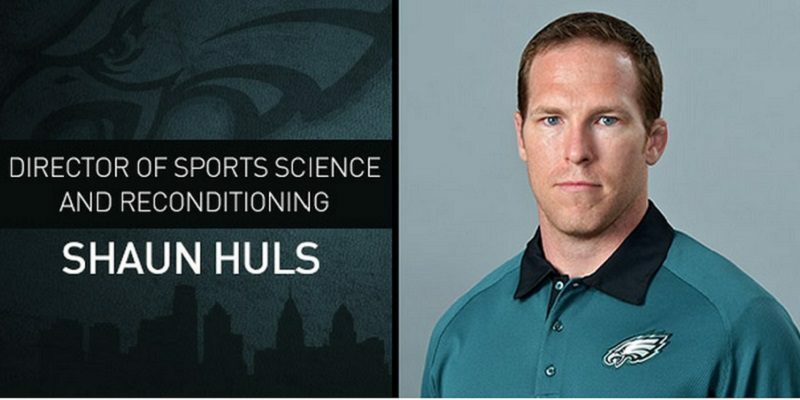 Shaun Huls, a very low profile former Navy Seals trainer, got a new job title last week: “Director of Sports Science and Reconditioning” (instead of the previous “Sports Science Coordinator”). The Birds also hired two sports science guys out of Oregon: James Hanisch, who ran the Ducks’ Sports Science program, as High Performance Analyst, and J.P. Crowley Hanlon, a recent graduate who majored in advertising, as Logistics Coordinator. What does this all mean? Besides the obvious fact that sports science is an important part of Chip Kelly‘s innovation, the word “reconditioning” has a particular meaning. I discuss it in more detail in an article in Bleeding Green Nation, but basically it’s a new approach to training elite athletes as they recover from injury. Instead of seeing injury and recovery as a “timeout” from your normal athletic regimen, reconditioning is an integrated process for restoring a top-level athlete to peak functioning. In practical terms, reconditioning takes longer than standard rehabilitation and discourages the use of braces. These concepts have practical implications for the Eagles this year. For one thing, it means that Sam Bradford and Kiko Alonso may not be playing at the start of the season. Many writers have assumed that inside linebacker Mychal Kendricks would be traded, since the Eagles acquired Alonso, re-signed long-time starter DeMeco Ryans and drafted ILB Jordan Hicks — who has had some serious injuries of his own — in the third round. If return from injury is being slowed, though, it makes sense that Ryans and Kendricks would start again, while Alonso and Hicks — a natural leader like Ryans — recover and recondition their way into the lineup. They would be more likely to replace the older players in 2016 or even later. The philosophy is deeper and more subtle than I can explain here, but it fits with Kelly’s process-based approach. It implies that he is reconceptualizing injury not as “bad luck” to be hoped against, but an inevitable part of the game that should be planned for and built into your training — and player acquisition. As Kelly has noted, there are 32 teams competing for the best players, and you have to find an angle that can help you acquire more than your share of them. Andy Reid tended to gamble on under-sized overachievers; the Dallas Cowboys appear to be going all-in on troubled or sketchy players (such as Greg Hardy and Randy Gregory) that other teams are reluctant to sign. This off-season, the Eagles have acquired a lot of players coming off of serious or chronic injuries, including CB Walter Thurmond, QB Sam Bradford, and RBs DeMarco Murray and Ryan Mathews. The Eagles appear to be grabbing all the full-sized, talented players with injury concerns they can. If their ability to rehabilitate players from injury is better than the rest of the league’s, it will be a very shrewd strategy. Not only will they get full-sized players with positive attitudes on the cheap, but those players will be motivated to stay with a franchise that will extend their career, and free agents will be inclined to come aboard. 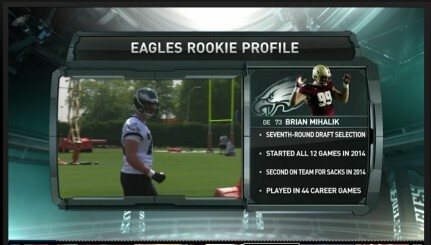 After USC WR Nelson Agholor, who we discussed in the last column, the Eagles picked three defensive backs, Hicks, and (in the seventh round) a giant and surprisingly athletic DE from Boston College, 6’9″ Brian Mihalik. Ex-Duck Brandon Bair (6’7″) made the Eagles’ roster last year and blocked two field goals; Mihalik is another gamble along those lines. Philadelphia only had six picks due to trades; they swapped their fourth round pick this year for Detroit’s 2016 third-rounder during the draft. That’s a good indicator that Kelly thinks the Eagles are at least a year away from contending. Given the massive changes on the roster, it’s common sense that they’ll take a season to gel. The secondary was the Eagles’ biggest weakness last year, and Kelly left no doubt that he is focused on fixing that. After acquiring three free agent DBs, he drafted Eric Rowe from Utah in round two, and JaCorey Shepherd from Kansas and Randall Evans from Kansas State in the sixth round. 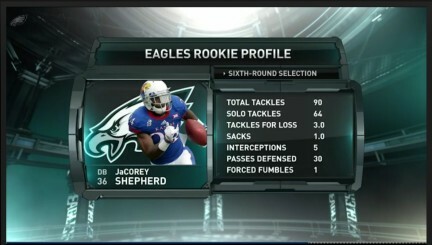 Normally you wouldn’t expect much from sixth rounders, but there is a lot of buzz about Shepherd. He is 5’11” and ran a slow 4.65 40-yard dash at his pro day due to a hamstring injury, which caused him to fall in the draft. The converted wide receiver has exceptional ball skills, though, and was close to a lockdown corner. Pro Football Focus pegged him as the #5 biggest draft steal this year. 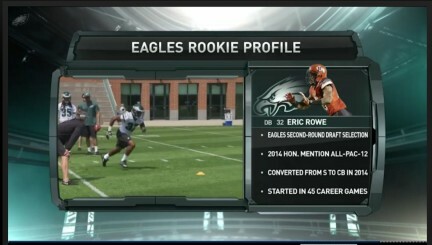 Eric Rowe is 6’1″ and played safety for three years before a successful switch to cornerback his senior year. He is starting at cornerback in off-season drills, but his versatility fits the Eagles’ deceptive defense well, and may bail them out if Earl Wolff and Jaylen Watkins wash out at safety opposite Malcolm Jenkins. All six draft picks have signed contracts already, along with 16 UFAs — including four much needed offensive linemen. New DB coach Cory Undlin will be responsible for shaping a drastically overhauled secondary. He has a lot to work with, including big free agent signee Byron Maxwell, but the Eagles will face a lot of great WRs this season. The potential is there, but this team has a lot to digest. They’ll be lucky to match the 10-6 record of Kelly’s first two years. After that, though — look out.